Right at the heart of Bangalore, Tipu’s Summer Palace gives you a glimpse into the city’s history. Spend an hour here and you’ll gain plenty of insight into Tipu’s life and Indo-Islamic architecture while snapping up Insta-worthy pics. Chaotic Chamrajpet seems an unlikely place for a lovely, little palace but you’ll be pleasantly surprised on your visit here. 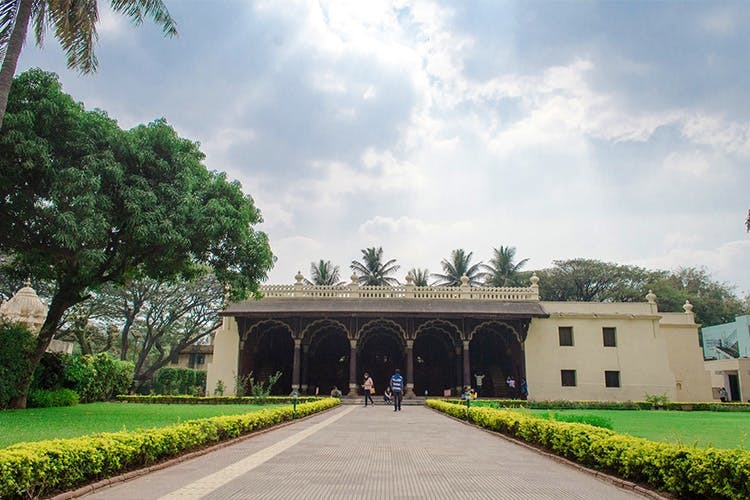 Just a short ride from KR Market, Tipu’s Summer Palace is where you can travel back in time and get a feel of what Bangalore was like in the 18th century. If you’ve visited other palaces in the state and around India, this one is going to come across rather Plain Jane. It’s only recently that the Palace has seen better maintenance, it’s still worth a visit (even a short one) for its intricate architecture and the patterned frescos that adorn the walls. At the ticket window, line up for your ticket (INR 15 for Indians with a small extra fee if you are taking a camera in) and then head towards the monument. The first thing that you’ll notice about Tipu’s Summer Palace are the sturdy teak pillars that are topped by arches that feature elegant curves typical of the Indo-Saracenic style. Do give the ceiling (especially at the doorstep) a close look since you’ll spot carved motifs all over. On the left side wall, you’ll also see a Farsi inscription that exults the building of the palace. On the ground floor, there are a couple of small rooms where you can gaze at fading frescoes. Many of the walls are covered in lovely deep reds and blues embellished with delicate floral patterns. There’s also a gallery that mostly features laminated placards that outline the life and times of Tipu Sultan. On the second level, you can swing by two small balconies where it is said Tipu used to hold court from. Almost completely decked out in wood, you can catch a view of the neatly manicured gardens in front. And marvel over the rows of symmetrical arches in front of you. There’s also a replica of Tipu’s tiger – a mechanical tiger that’s shown mauling a British soldier. However, we recommend that you Google images of the original installation (it’s now housed at the Victoria and Albert Museum in London) since the one at the palace look like a cheap toy brought from a mom-and-pop shop. Hitch a cab or auto ride to get here since parking here can be a hassle. You can easily spot the Palace on the main road itself. Also, since the palace won’t take you a whole lot of time, we recommend that you team this up with a visit to the 17th century Venkateswara Temple and the Bangalore Fort that are close by.